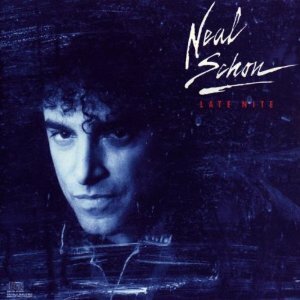 I decided to feature this album today because I’ve always been a huge fan of Neal Schon’s guitar playing. He’s always been my favorite soloist. I always felt that so many of the so called “guitar gods” never played with the emotion that this man does. We first saw him as a child prodigy with Santana at about age 16. He was the first “second guitarist” that Carlos ever had in his band. He’d play with them for a few years or so before forming Journey about 1973. This album was released in 1989 so the new band was well established at that point. He was indeed a star at this point even If that “duck quack- sounding” lead singer received most of the accolades. For the record, that duck quack line isn’t mine. REM’s Peter Buck said it first. I always loved it and he gives it at least slightly more credibility than I could! Night Life was mostly instrumental and that’s what I like about it. It allows Neal to play and play without having to worry about trying to make radio-friendly music. In fact I’ve read more than once that Neal wasn’t all that happy about Journey’s sound change. Sure, he didn’t turn down the money, but he felt they would have done just fine if they’d had stayed the course so to speak. It was produced by Bob Marlette. He always added most of the keyboards. He’d played on a ton of albums but hadn’t really been known as a producer much before this. You could hear him on releases by people such as Al Stewart and that great debut from Tracy Chapman. The bass player on the album is none other than American Idol’s Randy Jackson. This is a great album to listen to if you’re curious to how good he is. He really shines on some of these tracks. Steve Smith is on drums along with the great Omar Hakim. The album is all about melodies. Neal shows off his licks without getting to self- indulgent. The tracks aren’t over-blow and there isn’t what I’ve always called a, “chops for chops” feel to it. He’s still one of my favorite players.